so let me begin by sharing some info about the city and the Rock Garden ,which i fell in love with..the sculptures were so surreal and quaint! Chandigarh is the capital to both Haryana and Punjab and so is an important hub for education etc for these two states. The name translates from Hindi to English as "the fort of Chandi", Chandi being a Hindu Goddess. Known internationally for its architecture and urban planning, Chandigarh is home to numerous architectural projects of Le Corbusier, Pierre Jeanneret, Matthew Nowicki, and Albert Mayer. Commissioned by Nehru (1st Prime Minister of Independent India) to reflect the new nation's modern, progressive outlook, he famously proclaimed Chandigarh to be "unfettered by the traditions of the past, a symbol of the nation's faith in the future." 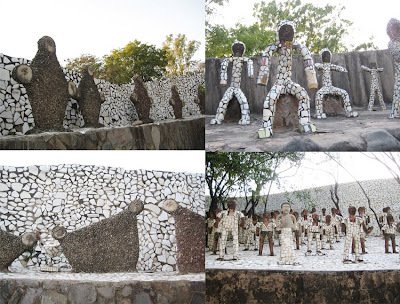 The Rock Garden project was secretly initiated by Nek Chand around 1957. the garden came into being at the time when the city of Chandigarh was being planned and reconstructed. (it is the first and amongst the few planned cities of India). Rock Garden has been established in the form of an open-air exhibition hall. The garden houses sculptures made by using a variety of different discarded waste materials like frames, mudguards, forks, handle bars, metal wires, play marbles, porcelain, auto parts, broken bangles etc. Nek Chand, the creator of the Rock Garden was a an employee with the Public Works Department as a road inspector and continues to reside in the city. He formed a collection of rocks, gathered from the Shivalik hills and the seasonal Sukhna Cho, Patiala Rao and Ghaggar rivers. In addition to the rocks other materials were collected. 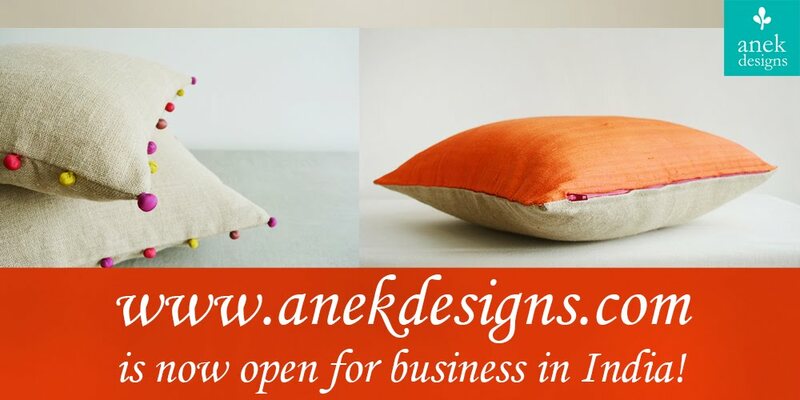 The material came from the villages destroyed to make way for the new city of Chandigarh. Certain fragments of these villages caught Nek Chand’s eye and he began actively searching and collecting particular discarded objects. These fragments were the remains of the villages, and consisted largely of everyday mundane possessions such as broken pots and bottles. With the PWD stores acting as a suitable decoy an alternative Chandigarh was being constructed behind the shuttering and scrap materials. The salvaging of scrap by Nek Chand is well reported, however, less mentioned is the pilfering of building materials. 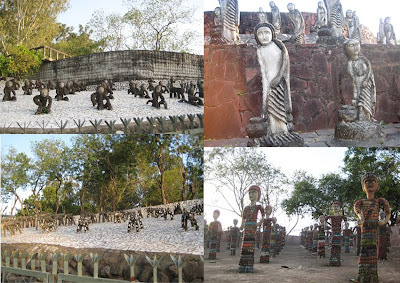 The PWD stores provided Nek Chand with a free supply of cement, bitumen, steel reinforcement bars and oil drums that he needed to develop the site. He was also able to second labourers who should have been building the roads, to work on his project instead (see Bhatti 1982, p224 & 234). The massive construction site that was Chandigarh provided a suitable decoy for Nek Chand’s covert hobby. Provided everyone was ‘working’ or ‘looking busy’ it seems that very few questions were asked. After four years work, involving daily commitment to the project working evenings and ‘by the light of burning tyres’ (Bhatti 1982), Nek Chand started to become nervous about his actions. It was possible that his employment could be terminated should his garden be discovered. However, this awareness did not stop the project or prevent Nek Chand from building and expanding the garden. In 1969 Nek Chand decided to visit the city’s chief architect, M.N. Sharma, a disciple of Le Corbusier. Although M.N Sharma should have arranged for the garden to be demolished, he claimed that his admiration for the work and Nek Chand’s ‘creative potential’ conflicted with his position as Chief Architect and Secretary of Chandigarh Administration because the work was illegal and unauthorised. He didn’t have the heart to go by the rules and advised him to continue his work in secret. It was an unusual position for the architect to take. and so rock garden stands next to the Sukhna lake, like a maze that leads you into a world of fantasy! i have visited the city but couldn't get myself to go to another garden and specially after rose garden and cactus garden and a few more...but well i would definitely want to go see the rock garden now. Corbusier rocks... nice post K.
hey i liked this post - i lived in Chd for 2 years - 97 -99. LOVED IT! coming form the US it was hard adjustment for a few months - then it was awesome - i stayed in sector 42 and partied in 18! ha! I was just thinking about you the other day and was wondering where you were since i got no comments from you in a long time! I would love to visit this garden!